A thief, two thugs, an assassin, and a maniac team together to fight evil in the galaxy. Sounds like a great premise for a movie. Now, what if I told you one is a tree that can only say three words and another is a talking raccoon that loves guns? Crazy, right? Well, that tree and raccoon steal the show in Guardians of the Galaxy, the newest installment in the Marvel cinematic universe. Not only is Guardians the funniest Marvel movie to date, it’s also one of my favorites of the year. Chris Pratt headlines as Peter Quill, or as he would like to be called, Star Lord, a human from Earth that was picked up by Yondu (Michael Rooker) and brought to space as a junker. Junkers are sent around the galaxy gathering valuables to sell to the highest bidder. At the beginning of the movie, he steals an orb of unknown value and origin and finds that it’s of greater significance than first thought. Peter Quill, along with the supporting cast of Gamora(Zoe Saldana), Drax (Dave Bautista), Rocket (voiced by Bradley Cooper), and Groot (voiced by Vin Diesel), are all given enough back-story to understand their motivations yet the exposition doesn’t hold the film down. Instead, it soars though humor and one of the best soundtracks in years. Some of the songs used will forever be linked to moments in the film. They are almost the sixth member of the group and show how music is the universal language. Pratt was perfectly cast as Peter Quill. He brings a loose, cool vibe to the team, not unlike Hans Solo did for Star Wars. But he is not the star of the film. 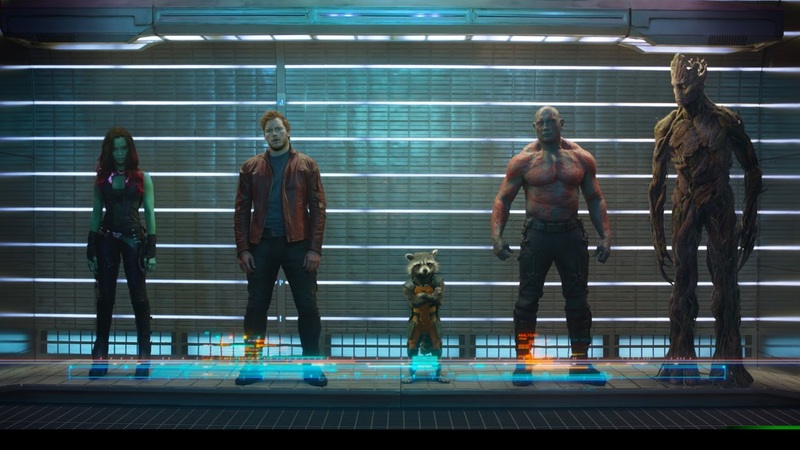 As ridiculous as it sounds to non comic book readers, Rocket and Groot are the best part of the movie. Every time they are on screen, they are funny, doing something hilarious, or being badass. Groot also creates some of the most beautiful scenes in the movie. Every kid that sees Guardians will want all the Rocket and Groot merchandise their parents will buy them. The antagonist, Ronan (Lee Pace), gives a good performance. He is menacing and looks great on screen. However, I did feel he was a bit underdeveloped and didn’t explain his motivations well. He did too much talking through exposition and not enough showing the audience his role in the galaxy. I also felt that Nebula (Karen Gillan), the daughter of Thanos and Gamora’ssister, was not used enough in the movie. These are minor issues for a spectacular film. It has giant scope and even though most of the characters are aliens, they all have humanity to them. While Guardians probably won’t win many awards, I have not had a better time at the theatre this year. And sometimes that is what is most valuable. Guardians will make you smile, laugh, and feel. Take the family and get ‘Hooked on a Feeling’. You won’t regret it.